Many of you very likely received a new gadget yesterday for Christmas and if you’re a geek like me you have already got that gadget set up, installed, updated and functioning well. Where is the gadget it replaced? Mine go into either a drawer or box along with all its cords and then just sits there. Well have you ever thought about recycling that old gadget and getting a few bucks back for it? I have done this recycle process twice. The first time I sent in an old cell phone that was working and the feedback I received from the company who took it for recycling was that it was not working when it arrived. My only option was to leave it with them or pay to have it returned to me after I had already paid to send it in to them. I opted to leave it there and am still not convinced that it wasn’t working. I now consider that a lesson learned – use a reliable company to do my turn in and recycling. My second attempt at recycling gadgets and getting a few dollars for them is currently in progress. I am using one of the newest players in this arena, NewEgg, who recently announced a new program that they have put in place to recommerce your old gadgets. They are not running it directly but it is obviously a major partnership for them as their logo is all over the site hosting the services. 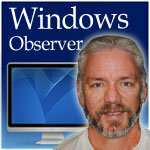 Windows Observer Windows Observer. permalink.